The company, which delivers services for transport infrastructure across the UK and Ireland, changed its name from Imtech Traffic & Infra earlier this year after being acquired by new owners. Now more than 230 operational vehicles have been rebranded and fitted with high-tech Motrak tracking devices in a deal with vehicle solutions firm Motiva Group. The project, completed in eight weeks, extends Dynniq’s long-standing relationship with Motiva, which will also supply new vehicles to the company’s nationwide fleet – many of them specially converted. 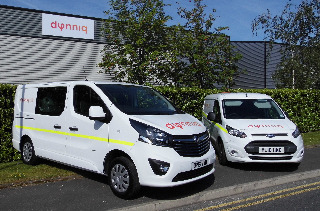 Elaine Wright, fleet manager of Dynniq, said: “The fact that the company changed its name created the need to change the logo on all cars and LCVs used by our staff. “It’s important to us to ensure our branding is strong and consistent and that the corporate image is reflected within our vehicle fleets. Motiva is now working with specialist converters to supplement the 450-strong fleet with new Ford, Vauxhall and Toyota vans as well as Skoda Octavia cars. Ian Birch, strategic sales director at Motiva Group, added: “Dynniq is a company which provides a range of high-tech services and their vehicle requirements are quite specific. “Many of their vans have to be internally modified and we have vast experience in supplying that kind of vehicle.